The drums have always been a real fascination for children, who are naturally attracted to percussion instruments. To choose, however, such a gift is not necessarily easy, especially if you do not have any musical studies, but you want a set of drums for children at a good price, suitable to practice at home. That is why we will provide you with some clear information with a wide practical applicability that will help you make the best choice, understand the price and spend your money wisely on kids drum set. First of all, we need to differentiate from the start the type of drums you are looking for. Do you want a toy for very young children to have fun with? Or do you prefer a more complex set, but still a toy, designed for the age of 4-5 years? Maybe your child seems really talented, and in this case you need a quality regular drum set, dimensioned for his age. The prices for these three options vary greatly, so you must determine which one suits you. There are different opinions about the best drum sets for children. Some people believe that for absolute beginners and younger juniors it is enough if the set includes a big drum, a snare drum), a tom-tom , a pedal for the big drum and a cymbal. Some sets, intended for more advanced use, may also include the special stool, an extra tom-tom and the appropriate supports, but nothing is mandatory. One of the difficulties children face when they start practicing this kind of instrument is related to their own size compared to the size of the drums. As a general recommendation, if the customer is less than 10 years old, a set of drums with a diameter of 12-14 inches is suitable. 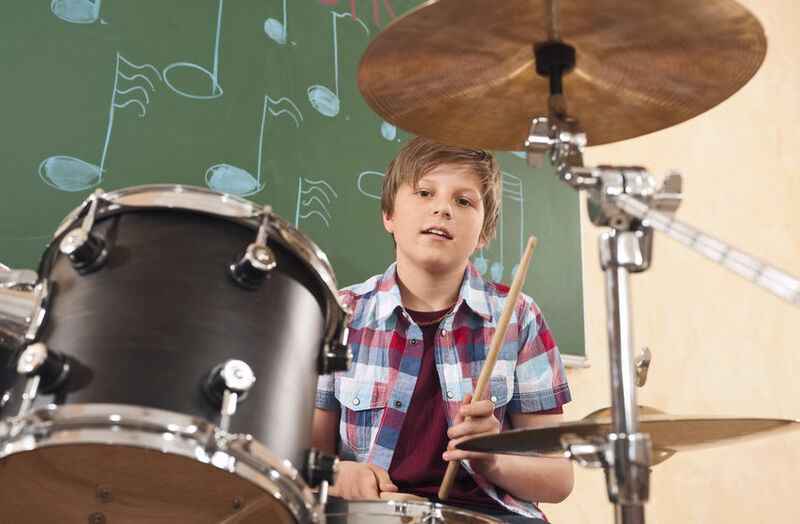 For older children, you can choose a beginner kids drum set with a diameter of 16 inches or even larger. As always, kids drum set packages that include all the necessary accessories to allow you start practicing immediately are more appreciated than others. Kids drum sets at good prices can include the stool, a set of sticks, tuning tools and various guidance materials to help them learn how to play. This aspect varies significantly depending on the type of the model you choose and the materials it is made of. If you choose a set of toy drums, you should not be surprised if they start to show signs of wear and tear after just a few days of intense and enthusiastic solicitation (though, admit it would be nice to resist more than this!). On the other hand, if we were talking about a real set for beginners, there are a few elements that you can take into account as good indicators of resistance and durability. For example, wooden drums are more durable than those made from other materials. Drum sticks must be sturdy, solid, of good quality materials and have a look that inspires confidence – a feature quite hard to find in sets destined for children.